The year I lived in Tunisia opened my eyes to a whole new world of Jewish culture, especially during the spring holiday of Lag b’Omer. The holiday takes place thirty-three days after the first day of Passover. In my American community, we celebrated with a picnic, but on the Tunisian island of Djerba, the El Ghriba synagogue hosts a two-day international festival infused with barbecue smoke and kabbalah. To share a bit of that Tunisian Jewish culture, I’m sharing a pattern of good luck symbols from Djerba for you to use in decorating a picnic blanket. Don’t have a tablecloth? Turn any piece of square or rectangle fabric into a tablecloth by finishing the edges with mitered hems — Sew4Home has great mitered hem instructions. 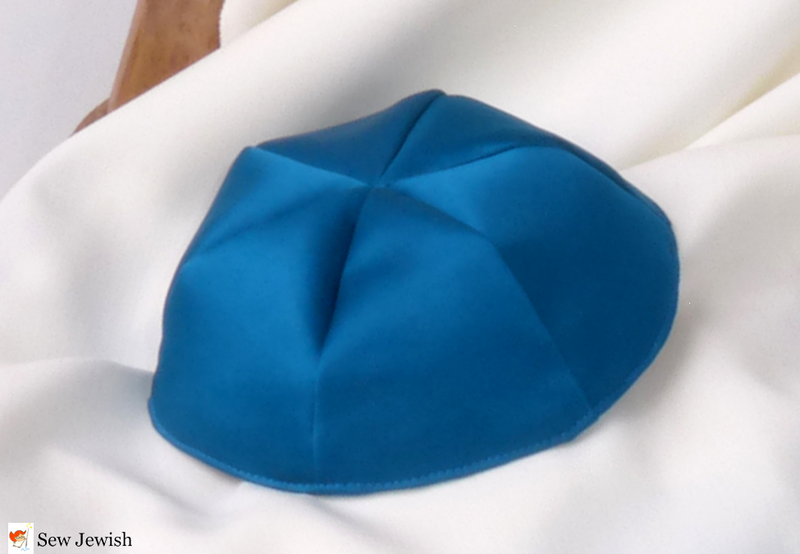 This project appeared on my first website of Jewish traditions more than 12 years ago (12 years – yikes!). 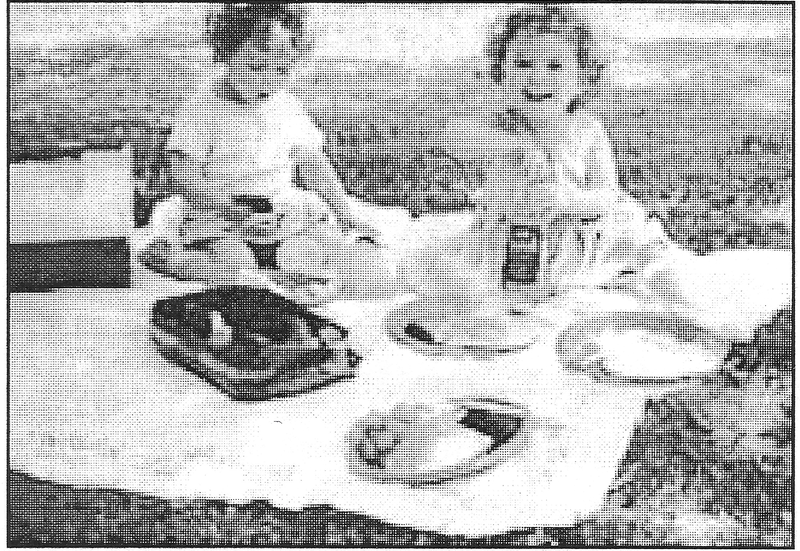 The black and white image of my daughters picnicking with the blanket is a scan of a printout of that original article. 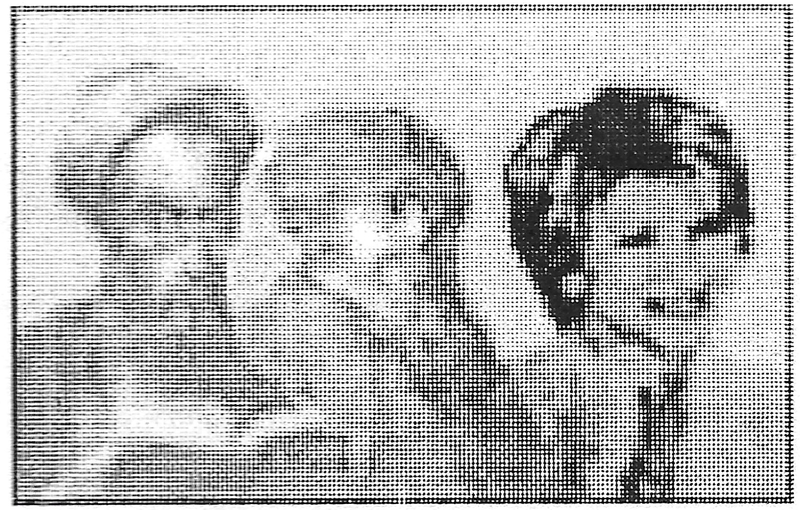 As an experiment in gracious living, we brought together Torah scholar Rabbi Akiva, fabled Kabbalist Rabbi Bar Yohai, and billionaire life stylist Martha Stewart. We locked our three experts in a room and gave them a plain white tablecloth, an indelible fabric marker, and artificially-distressed terra cotta garden urn, and this simple instruction: Dazzle us. This is what they came up with: a Lag b’Omer picnic blanket hand decorated with good luck symbols from the Jewish villages of Djerba. Wow. 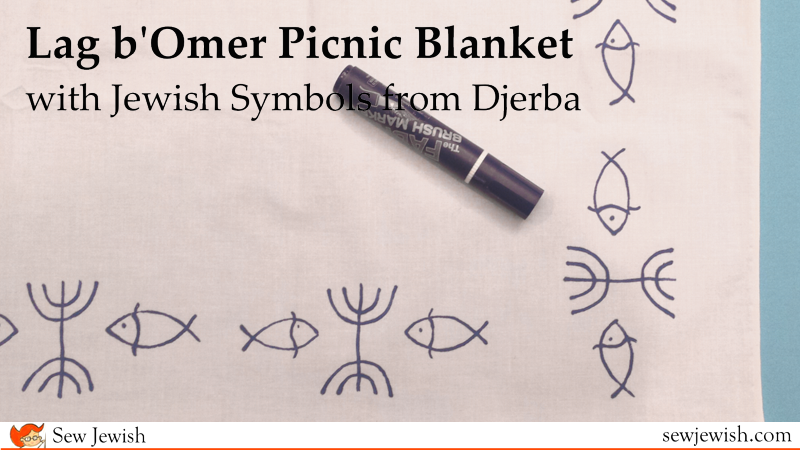 Djerba, a Tunisian island located off the coast of North Africa, hosts a two-day Lag b’Omer festival, steeped in Sephardic tradition, and Ashkenazi Jews often celebrate the spring holiday with a picnic, so this picnic blanket combines two sets of Jewish traditions. The basic design motifs repeated around the edges of the picnic blanket are a fish and a menorah, which can also represent fish scales or a palm tree. The two symbols appear often as hand-painted decorations on the outside walls of the homes on Djerba. Decorating the blanket is easy, and since it involves recreating simple, hand-painted figures, you don’t need any artistic skill. You just need your own white table cloth and a blue permanent fabric marker. When Lag b’Omer comes, grab your friends, some food, and the blanket and head for the nearest park. 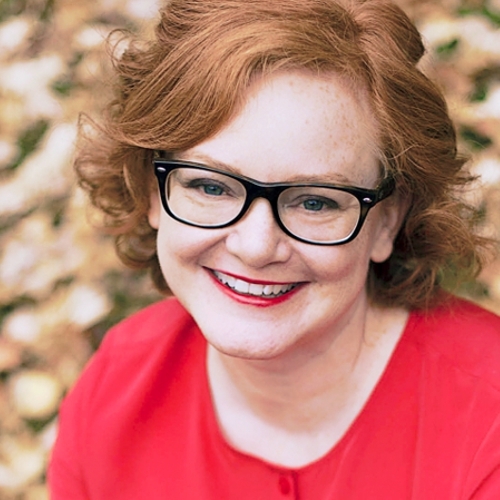 For a final flourish that tells your friends, “I care about you,” Martha recommends using the terra cotta urn as a delightful serving dish for a cherry-rhubarb trifle. But we think that’s a bit much. – Print a copy of the Djerba good luck symbols pattern. – Fold the blanket in half to find the middle of one side and mark it with a pin. Open the blanket and lie it flat. – Using the marker and the pattern as a reference, draw a menorah at the midpoint of the side of the tablecloth, and inch or two (2.5cm – 5cm) from the edge. Add the fish on either side. For help in spacing the symbols, place the pattern near the edge of the cloth. Don’t worry if the symbols don’t come out neat or evenly spaced –figures that look obviously hand-drawn will capture the hand-painted, graffiti-like style of the symbols on the houses of Djerba. If you want more control over the drawing of the symbols, use the transfer paper to transfer the pattern to the cloth, and then trace over the pattern with the marker. – Draw more sets of symbols along the entire side of the table cloth, working toward the corners. – Decorate the other three sides of the cloth in the same way. Would you like to get an email notice when we post new projects? 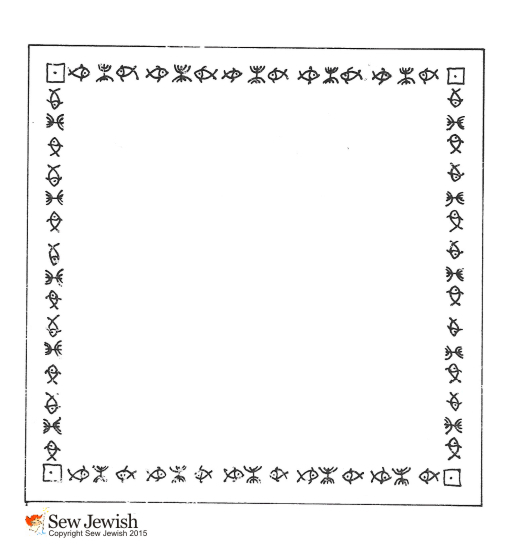 Follow Sew Jewish — at the top of the right-hand column. And for more exclusive content, subscribe to the newsletter. Tags: Djerba, Kabbalah, Lag b'Omer, menorah, picnic blanket, Tunisia. Bookmark the permalink.